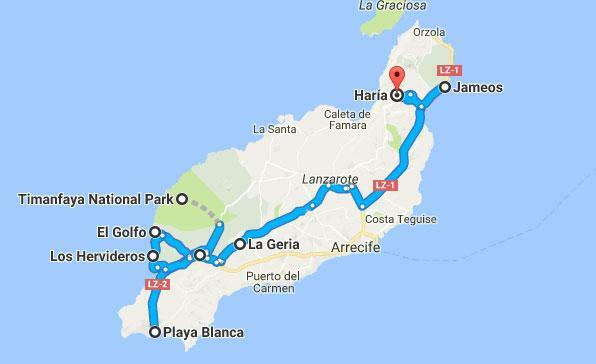 The Grand Tour of Lanzarote is one of the best tours!!! best from North to South. We also offer the option of adding a food and drinks package to your tour. Sit and relax on a fully air conditioned coach with an English speaking guide, so that you are more than comfortable to start discovering Lanzarote. 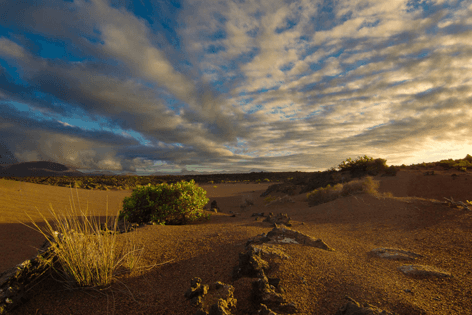 The Grand Tour heads along the coastal road, taking in the sights of the rugged coastline and volcanic terrain of Lanzarote, simply breathtaking. Be amazed when you see the tiny salt hills at the Salt pans of Salinas de Janubio where the sea salt is made. 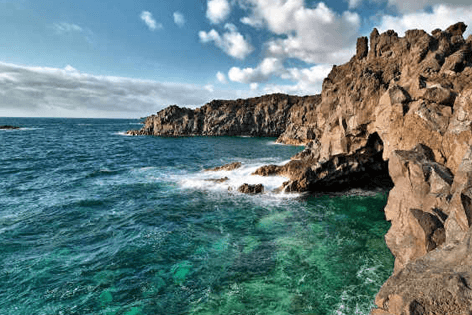 See the views as we drive through and past Los Hevideros,experience the amazing rock formations that have been created from the hot lava as it hit the cool sea, creating stunning caves and coves that the waves hit and shoot into the air. Known as the emerald lake, this is where the volcanic eruptions caused a huge crater which filled back up with seawater and turned an incredible emerald green colour. An amazing sight and if you are lucky enough you may find your very own semi precious olivina stone in and around the lake. If not you can buy them for as little as €2 as a souvenir. At the centre of the fire mountain you can see the geothermal experiments. Watch in amazement as they throw hay and straw into a crater hole and it bursts into flames due to the intense heat. Stand back and gasp as they pour water down smaller holes and it boils instantly and shoots into the air with a bang. The Timanfaya Camels are one of the highlights of the Grand Tour. These fascinating creatures are available for you to take a ride up the volcano. One camel takes two people and you will certainly feel like Laurence of Arabia as you take the fun ride through the perfect landscape. The camels work in shifts and teams and are very well looked after. After the experiments and camel rides (PAID LOCAL), the coach takes you on an exciting luna tour, right into the heart of the national park. 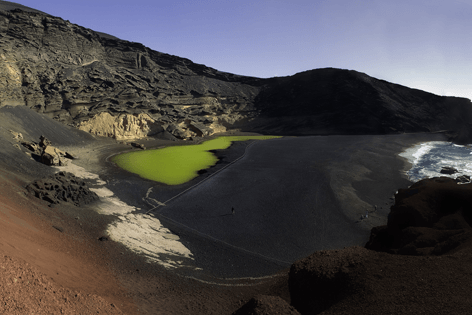 See the breathtaking colors and shades of the rocks, take in the sulfur smells and imagine the time where the volcano erupted, be fascinated by some interesting information about the whole event as told by your very informative guide. Here you can visit the famous church of Nuestra Señora de los Dolores. Enjoy a buffet style lunch, including wine and water with your delicious meal. Where you will see how the wine is made, from how the grapes are grown in the volcanic ash giving the wine a very unique taste. Enjoy your visit to a wine cellar and Bodega where you can sample and purchase the wine to enjoy at home. At this viewpoint you will see thousands of palm trees that were planted many years ago. It is said that every time a child was born they planted one palm for a girl and two for a boy. The Houses in Haria have also been built and situated in a special way and from the viewpoint you will see the houses are shaped like a star, amazing feature of this Lanzarote Tour. The impressive work by César Manrique, home to the white albino crabs which live in the natural pools. Take a walk through a huge cave which is used for concerts due to the incredible acoustics. Visit the stunning pool, designed especially for the King of Spain by César Manrique himself. 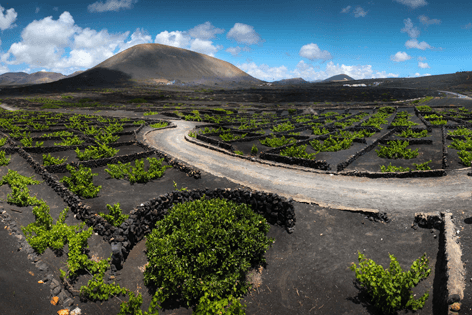 You will enjoy this scenic oriented Grand tour, one of the best attractions in Lanzarote. 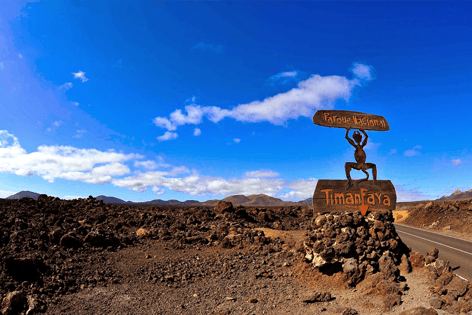 All pick ups and drop offs on air conditioned coach with an English speaking guide, All entrances to each stop such as Timanfaya and Jameos Del Agua. Take a pullover as some times of the year, it can be windy, June - September you may not need one. Wear comfortable footwear. Take a bottle of water for the transfer on the coach, if you have booked without lunch you can usually get the hotel to prepare you something.